The Waterside Half Marathon was number 14 in my #18in18 Challenge and, as if that wasn’t prestigious enough for the organisers, it also doubled up as the NI & Ulster Half Marathon Championships! If you don’t know Northern Ireland, the race is located in our second city, Londonderry or Derry, or Derry-Londonderry, or Stroke City or even the Maiden City. Stuff it, it’s based in the same city as Channel 4’s Derry Girls!!!! That’s all you need to know. And, before I begin the story of my race, let the facts show it was one of the slowest I’ve done this year although still reasonably comfortably within the cut-off time. You’ll find out why if you read on. In addition, I just didn’t run your bog standard 13.1 miles, it was more like 16. That was because, with the Dublin Marathon less than two months away, Iverene and I added distance on before and after the race to bring our miles up. In effect, this was a long run with a race stuck in the middle. In order to reach that distance we decided on 1.5 beforehand, the race, and then 1.5 afterwards. I’ll be honest, I wasn’t feeling it during the warm-up. Whilst I always find warm-up runs difficult it’s usually just because I’m creaky and, well, it *is* a warm-up after all. But, with the benefit of hindsight, this felt different. It wasn’t fast or anything like that, I just felt worse than normal. We did the warm-up around the starting area at Ebrington Square and then an out and back over the Peace Bridge before taking our place at the very back of the pack for the start. My pre-race tactics were to try to maintain 12-minute miles all the way round. That meant not going too fast at the start in the hope that the energy saved would help me in the latter part of the race when I would likely struggle. And I did manage it during the first few miles but what I hadn’t reckoned on was the sizeable inclines right from the beginning so whilst I was reserving my pace I was still working hard because of the climbs. I might as well not have bothered. For two miles it was up, then a steep drop before some more little rises. This brought us to around the halfway mark when the Foyle Bridge happened … I took one look at it and thought, ‘nah’. I just didn’t have the appetite to run it. It’s a brute of a thing which, according to my Garmin, rises to almost 180 feet and just seemed to go on and on. At the bottom I couldn’t see across to the other side. It was quite daunting. The race hadn’t been going terribly well anyway but this just zapped any linger enthusiasm I had left so I made the decision just to walk over the bridge and finish the race without any real regard for time or pace, other than to make sure I was within the 3-hour cut-off. It was quite a sombre experience being on the bridge. Because of its height, it tends to attract people struggling with their mental health and a very recent initiative this summer has led to numerous messages of hope being to the railings all along the bridge. It was sobering, but also uplifting, reading them. 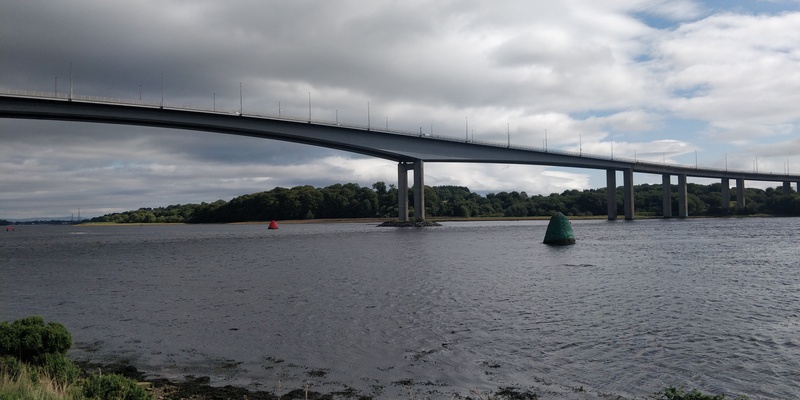 Once the bridge had been navigated the course was more or less flat, hugging the River Foyle for the remainder of the run. Normally I would relish this but, I’m afraid to say, I wasn’t in the mood for it on this occasion. For me running is as much mental as physical, and I wasn’t enjoying this so I basically stopped trying. It was a lovely course, the support throughout was fantastic but none of that encouraged me to put anything into it. I knew we had to go back over the Peace Bridge to finish but we passed it after about ten miles so it was quite demoralising to have to run past it before turning to come back again. So near but yet so far. And even when we crossed the bridge we then had to run out and back the length of the square before turning for the finish which was the other side of the tree line. I knew it was there, but I couldn’t see it. It felt like I’d never get to that final turn. I knew if I could see the finish I’d put in more effort to get there but, given my mood, I couldn’t even be bothered doing that. In the end, thankfully, I did see it and I just sauntered over the line. Disappointed but relieved. After a brief rest, a drink and collecting my medal, it suddenly dawned on me I still had more to do. I really wasn’t in the mood for it and I’d hoped Iverene would have forgotten about it. But, alas, no. I managed just short of a mile before, being unfamiliar with the area, we ran out of somewhere to run so we went back to the square thinking a lap of that would bring us up to distance. Unfortunately we were still short. By now I couldn’t really be bothered with doing laps so it called it a day but Iverene ran on to do two more laps. Fair play to her, on another day it wouldn’t have been much of an issue for me but today wasn’t my day. I think I ended up at 15.7 miles – more than enough in my mind. It did bring me over last year’s overall total mileage which was a significant milestone with still a third of the year remaining! Before I finish, a special word for Iverene. Not just for her company all day but to congratulate her on a new personal best, coming in under 2:30, an absolutely fantastic performance! For me it’s a case of gathering myself together and going again this Sunday in Chippenham for #15.